Meat is more moist when done. Uses charcoal not oil or gas. No need to tend to the meat while it is cooking. Some may not approve of charcoal. A rather new product so there are not a lot of reviews. But it seems to be a quality built smoker and worthy of a try. 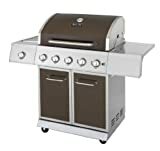 The Orion Convection Cooker is a unique smoker/grill in that it uses convection heat instead of direct heat. The charcoal is placed around the outside of the cooking cylinder which heats the inside. It meat cooks faster and is very moist when done. 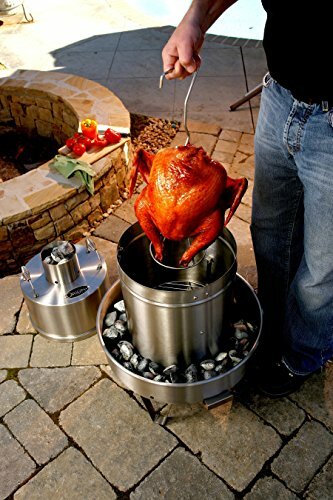 Comes with 3 rib hangers to accommodate 6 racks of ribs, 3 cooking grates providing 398 square inches of cooking surface, a poultry stand and lifting handles which holds a 24 pound turkey, manual and cookbook.